I fondly recall facilitating one my first women’s leadership workshops for Edwards Executive Education, University of Saskatchewan, about 30 years ago, and drawing upon women’s leadership pioneer and expert, Sally Helgesen’s first book The female advantage: women’s ways of leading (1990).This landmark book, focusing on what women have to contribute to the workplace rather than what they lack or how they need to change is as relevant today as it was then, as organizations continue to seek to become more inclusive and less hierarchical. 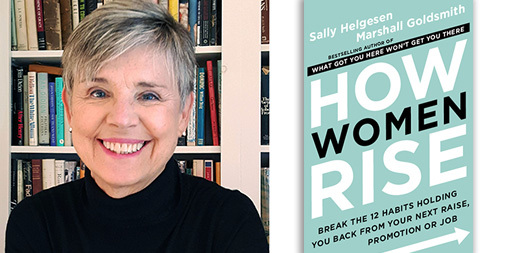 And as I prepared for our recent Empowering Women Leaders Retreat, offered through Edwards Executive Education, I read Sally’s most recent book How women rise: break the 12 habits holding you back from your next raise, promotion or job (2018) coauthored with leadership coaching legend, Marshall Goldsmith. How Women Rise supports women to lead with their strengths and focus on their contributions; identify habits that might get in their way; and provides a simple 4 step process template for changing habits. The book names 12 habits that likely helped you to get to where you are now as each one is rooted in a strength. However they may get in the way of your advancement to greater influence and contributions. With more women leaders in higher places and positions of influence, they will have the opportunity to further shift culture and structures to support greater inclusivity and relational ways of leading. 1. Overvaluing Expertise – “trying to master every detail of your job in order to become an expert is a great strategy for keeping the job you have. But if your goal is to move to a higher level, your expertise is probably not going to get you there” (p.86). I look back on my career and I see that I always over prepared, over perfected, looked to a book, articles to “know it all” very often times at the expense of self care, time for deep reflection, building relationships and visibility. This is not surprising in my experience, as I often felt throughout my career, as a woman leader, I needed to prove my value and expertise. The strategy that is helping me overcome this is with a mantra “ I am enough, I know enough, I do enough” and taking time for relaxation. Check out my blog Relaxation is the New Preparation. When I take time to relax, I sleep better and show up more deeply present, authentic and easily access my wisdom and insights. Remember overvaluing expertise is rooted in a healthy respect for all the knowledge and skills your job requires and a willingness to work hard to master them. And for me there comes a time when “enough is enough”! 2) The Disease to Please is “the desire to be wonderful in all circumstances – to be thoughtful and nice and make everyone around you feel good”(p136). Pleasers are motivated by the desire to be helpful, with a reluctance to burden others or ask for help, or let down anyone who might have relied on them in the past. They are givers, nurturers, and sensitive to human interaction, which from my experience sure gets a practical workout being a mother! Accompanying this is guilt around not meeting the desires of others or living up to others expectations. One strategy that has helped me, is setting boundaries. For example when I get requests be it for work, volunteer opportunities, from family … to always say I will get back to you. Building in space allows me to reflect, to check my motivation and whether it serves the highest good for all, including myself, and then to respond rather than react. Also I have learned that “ No” is a complete sentence and I don’t have to give a reason or over explain my decision. Remember, the disease to please is rooted in the healthy unselfish passion for helping others and making others happy…. I just need to add myself to the equation! For overvaluing expertise, I chose relaxation is my new preparation. For the disease to please, when I get requests, I always state: “ I will get back to you.” Then I deeply feel into what is my underlying motivation. How does this align with my purpose and intentions? Does it serve the highest good for all, including myself? This guides my conscious choice making and decisions. I am part of a “triad” with two other women leaders and we have been meeting monthy for 8 years now. We celebrate breakthroughs in our leadership and peer coach one another on breakdowns or difficulties. I have consistently received feedback that I am a nonjudgmental person. However, I have not always extended that generosity towards myself. I need to remember to treat myself the way I treat others and cultivate self compassion. 4. Remember what got you here. These habits are rooted in strengths and there is a healthy expression of each one. My valuing of expertise got my here by being a radical life long learner and growing myself as an integrative leadership development facilitator and coach! And I affectionately say, “ Yes I have strengths, yes I have development and I will be working on my leadership development the rest of my life! I am evolving and helping others to do the same. My pleasing others is rooted in my deep desire and burning passion is to help others embrace the leader within and be leaders of their lives! This has made all the difference in the quality of my life and I know the lives of others. To further support you, check out Sally’s free How women rise discussion guide This would be great for book clubs and in organization conversations supporting women leaders to rise. Check out Sally’s website for other resources, podcasts, webinars.